According to mythology, a man called Pylas, who came from Megara, settled in the ancient area of Messenia and was later expelled by Neleus. Neleus and a group of Pelasgians came from Iolcos in Thessaly, once home to Jason, as in ‘Jason and the Argonauts.’ Pelias, Neleus’ brother, exiled him for some reason, (none has been given in any of the references used or searched) and hence he and the Pelasgians head for Messenia and make Pylos their home. King Nestor was one of Neleus’ son. In 1939, archaeologist Carl Blegen, arrives at the site in search for the famous city of Pylos and in particular, Nestor’s palace. During his excavations, he uncovers a vast site on the hilltop where evidence of extensive structures emerge and shards of Mycenaean pottery. In his investigation, Blegen discovers the building/s had been occupied during the era of the Trojan War, circa 1,300 BCE. He also uncovered numerous tablets written in Linear B, a script used by the Myceneans, an adaptation of Linear A, which was first invented by the Minoans. Links between Homer’s Iliad and the tablets provided enough evidence for Blegen to suggest Pylos was indeed the city referred to by Homer. The other interesting feature about Mycenaean palaces was how much they resembled Minoan palaces. The Minoans were a seafaring power with extensive trading partners. To read more, click here to go to blog post. Following the decline of the Minoan civilisation, Mycenaean artwork, architecture, jewellery, female deities and script showed a strong Minoan influence. There is an interesting article by NY Times that discusses the connection between the Minoans and Mycenaeans. Historical fiction novelist and a secondary teacher, Luciana Cavallaro, burnt out but not done… yet. Still hanging on. ← Introducing: Luc’s Premiere Street Team! Fascinating. It’s amazing how much we don’t remember about our past. This is one reason I love historic fiction (such as yours). It puts me right there. Just in case they needed it ;D Or if anyone wanted to know where it was. “Nestor’s cup, good to drink from. Whoever drinks from this cup, him straightaway. the desire of beautiful-crowned Aphrodite will seize”. Thank you, Aquileana 😀 They did find amazing artefacts, which does support Homer’s story about Nestor, as it did with Odysseus and Ithaka. I love the quote. Quite apt too. Below is a reblog of a post by Luciana Cavallaro​ regarding the start of a series of posts about the Ancient Mycenaean Civilization. She is writing a #HistoricalFiction #Mythology series of time travel and a hero’s journey in the the Servant of the Gods series. 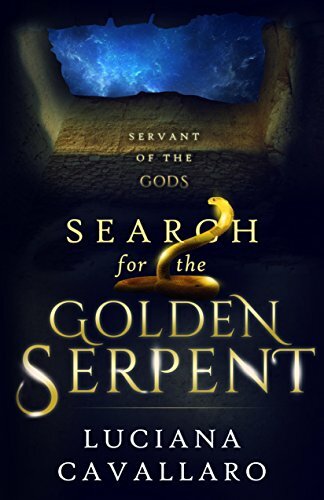 I’ve read the first book which I gave 5 of 5 stars on Goodreads: Search for the Golden Serpent. I’m eagerly waiting for the next book in the the epic mythological odyssey. Enjoyed this post immensely Luciana Thank you. An excellent post and a wonderful series- I’ll be following along all the way! I would be quite honored if you will allow me to repost this on my blog TheShieldofAchilles.net – please let me know if you agree! Thank you for another enlightening post! Always so informative. I very much enjoyed the quick read on the history behind the city of Pylos. You know how much I love ancient history.